As state ratification conventions debated the new Constitution submitted to them in September, Thomas Jefferson wrote this letter, from Paris, to Uriah Forrest (1746–1805) expressing both his admiration for the framers and his concern over the “seeds of danger” they had sown by presuming that succeeding rulers would be as honest as themselves. Gift of André de Coppet, Class of 1915. André de Coppet Collection, Manuscripts Division. FOR FURTHER EXPLORATION: See the finding aid for this item. 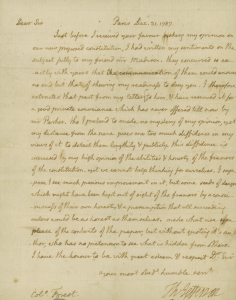 Explore similarly tagged items: Jefferson, letters, manuscripts.